Where seen? 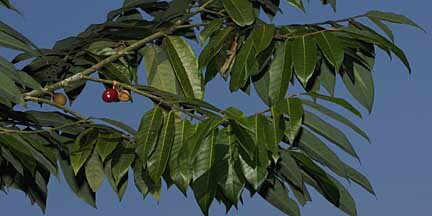 A pretty tree with fresh green leaves and bright red fruit, it is a rare tree. There are several on the rocky cliffsides of Chek Jawa, Pulau Ubin. According to Hugh Tan, it is also found on St. John's Island. It was previously found on Changi and Pulau Ubin. 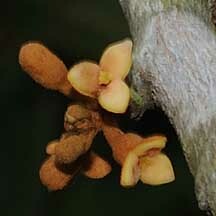 Elsewhere, it grows on rocky and sandy coasts and is common in lowland forests of Malaysia. It was previously known as Knema missionis or Knema sphaerula. 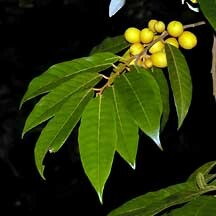 Features: A tall tree (4-5m to a maximum of 24m). 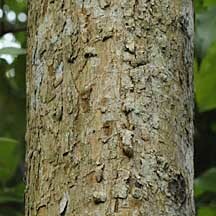 Bark brown to dark green and smooth-scaly to scaly. Twigs are slender and at first rusty scrufy turning dark brown or black. 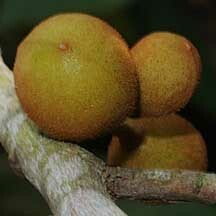 Leaves eye-shaped (4-5cm long) leathery and thin, hairy beneath and arranged alternately. Flowers tiny (0.5cm) brown and woolly on the outside. 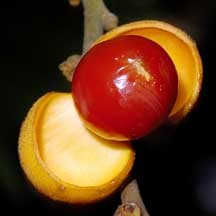 Fruits globular (1-2cm) with a thin skin, when ripe, splitting to reveal a bright red and pulpy aril which probably attract birds that disperse the seed within. Human uses: According to Burkill, the wood is not durable but it is sometimes used for rafters. Status and threats: Previously thought to be extinct, with the discoveries of some trees in Pulau Ubin and St. John's Island it is now listed as 'Critically Endangered' in the Red List of threatened plants of Singapore. 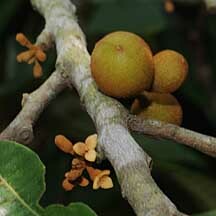 Knema globularia on the NParks Flora and Fauna website: photos and fact sheet.